Who is ready for Halloween? Me, me and oh yeah, ME!! I’m a true believer in making this “season” last as long as possible. So, over the next couple of weeks, I’m sharing several Halloween party & decor ideas with you. 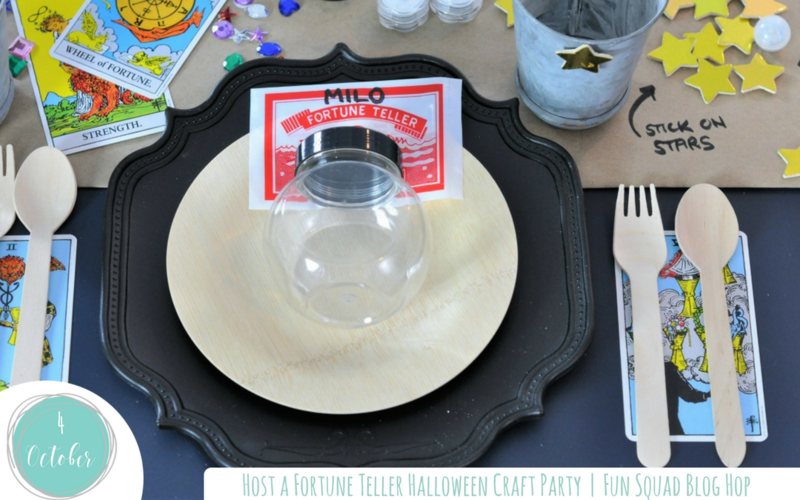 Starting with this fun Fortune Teller Halloween Craft Party. This Halloween party is part of a blog hop hosted by the aptly named, Fun-Squad. That’s right, the fun doesn’t stop here, there are 5 more Halloween parties for you to check out. You’ll find the links to each at the end of this post. You can also enter our hop giveaway. $75 in Halloween goodies from Oriental Trading! Let’s get started with my Halloween prediction… I’m “seeing” a Halloween Party theme that is perfect for all ages! That’s right it’s a Fortune Teller Halloween Party This party has something for everyone. Kids get to create their own DIY Crystal Ball and adults get to have a little fun reading the tarot cards and predicting the future! This party was inspired by my love of all things freak show & carnival including the resident fortune teller. Although I LOVE the American Horror Story version of a freak show, I kept this party much (I) more child-friendly. I started with a fortune tellers booth. This doubled as both the party backdrop and somewhere I could “read” my crystal ball and give out fortunes to the kids and adults. To help me with random fortunes I found some fun vintage 1950’s fortune cards. Quirky fact, these are the same fortunes dispensed by the swami in a Twilight Zone episode. Then I hung a large lace spider web backdrop. This is actually a large tablecloth that I picked up last year at Target during the after Halloween clearance. Over this, I draped popping Purple Glitter Tulle Roll and then hung a glitter glass “BOO” from The Wendy Addison. On the table in front of this, I set up a fortune-telling table covered in Halloween fabric, velvet, and a Lace Tablecloth. On top of these vibrant colors and the mix of eclectic patterns, I placed not only my DIY Crystal Ball but a fun fortune teller print, purple feathers, tarot cards and items I already had in my party stash, gemstone skulls, rabbit’s foot, black candelabra, arsenic bottles, and rats! Last but not least a seat for me and my brave fortune seekers and twinkling black cat lights! My kids LOVE crafts and making things, so to include them I set up the table to double as a DIY Crystal Ball craft table. Then instead of handing the supplies to each child, I decided to display all the craft supplies on a black table top with a kraft paper table cover. On this, I wrote the names of supplies directly onto the paper. This way of displaying the craft supplies added a wow factor decor element to my party space. Each guests’ place setting included their plate, cutlery and their DIY Crystal Ball for filling and decorating. I used fortune fish as the place setting names, a sharpie works great to add names. Beside each place setting, I also added a small tin vase that held the glitter for their crystal balls. In the center of the crafting table, I added a real crystal ball I found on Oriental Trading. Nothing like a bit of fun inspiration for the kids! Who loves party favors?! Kids!! I loved putting together a box that was big enough to hold their DIY Crystal Balls, as well as a few fun, take-home gifts for fortune telling at home. Fortune fish, playing cards, a tarot card and chocolate coins for passing over the fortune tellers palm. Everyone leaves with a little more in the way of good luck, good fortune and good memories! Don’t forget to enter in our giveaway to win $75 of product from Oriental Trading. The Rafflecopter details are below! Thanks for partying & crafting with me! Hope you enjoy the hop!